The Trenton Thunder jumped out to an early lead over the RubberDucks on Tuesday night and never looked back, scoring in each of the first four innings on its way to a 7-2 win over Akron at Canal Park. The key to the game was the first inning. 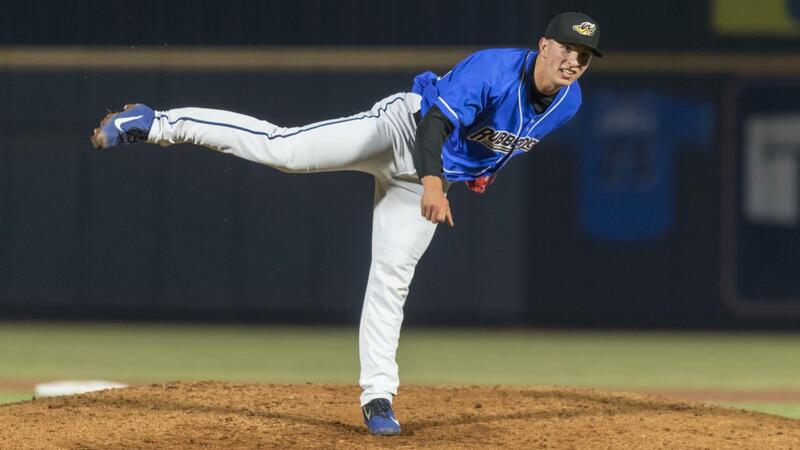 After the Thunder jumped out in front 3-0 on three unearned runs coming on two Akron errors, the RubberDucks answered with two runs, cutting the deficit to 3-2, on a two-run bases-loaded single by Mitch Longo . However, Trenton added single runs in the second and third innings and a pair in the fourth to extend its lead to 7-2. RubberDucks starter Sam Hentges struggled early in his second start, allowing seven runs (four earned) on nine hits through 3.1 innings. The three runs in the first inning were all unearned, but he allowed a solo homer to Hoy Park to lead off the second inning and a two-run homer to Wendell Rijo in the fourth inning. However, the bullpen effort was excellent as the pen retired all 17 batters faced in order. Luke Eubank threw 2.2 innings, fanning two, and Rob Kaminsky threw perfect frames in the seventh and eighth innings. James Karinchak struck out the side in order in the ninth. For Trenton, starter Nick Nelson gave up two runs to the RubberDucks in the first inning but only made it through four innings. James Reeves and Domingo Acevedo each threw two scoreless innings, with Acevedo's three strikeout performance helping him get awarded the win. The Ducks were not able to get much going offensively, leaving seven total runners on base through the first three innings, and amassing six hits off Trenton pitching. Andruw Monasterio also collected a hit in the second inning, extending his hitting streak to four games. The RubberDucks have now lost six in a row which continues the worst start to a season for the Akron franchise …Akron Bullpen retired all 17 hitters they faced tonight… The RubberDucks won the season series over Trenton last season 5-4… Time of game: 2:51… Attendance: 2,001. The RubberDucks will finish up the homestand's finale against Trenton on Wednesday night at 6:35. RHP Jake Paulson will start for Akron and RHP Trevor Stephan will start for the Thunder. The game will be broadcast on Fox Sports 1350 AM, the WARF iHeart channel, and the TuneIn Radio App.